Bill Snell, a CCD teacher for 43 years, said at St. Patrick’s Church in Stoneham that he thinks allowing devout married men to become priests is a good idea. Many Catholics attending Mass in the Boston area Sunday welcomed Pope Francis’ comments that appeared to indicate an openness to ordaining devout married men in communities suffering from a lack of priests. At the Cathedral of the Holy Cross in the South End and St. Patrick’s Church in Stoneham, parishioners praised the pope for recognizing the dearth of priests in the church and the institution’s need to evolve in order to survive. “I’ve always been hoping — and praying, I would add — that someone on high would come to this realization, because the most important thing is that we have enough priests around,” said Christina Gagne after Mass at St. Patrick’s Church. In an interview published Thursday with the German newspaper Die Zeit, Francis stressed that removing the celibacy requirement is not the answer to the Catholic Church’s priest shortage. But the church must consider whether married men of proven faith could be ordained, and “then we must determine what tasks they can perform, for example, in remote communities,” he was quoted as saying. The New York Times reported that in the United States, there are now about 2,500 Catholics per priest, compared with 851 per priest in 1972, according to the Center for Applied Research in the Apostolate, which is affiliated with Georgetown University. Statistics by the center show that other areas of the world — particularly Africa, Asia and Latin America — are facing much worse ratios, including Brazil, which has 8,000 Catholics per priest. One problem behind the dwindling number of priests is the many who leave the priesthood in order to marry. The Rev. Jim Griffin, a CITI Ministries member who left the priesthood in 1990 to marry his boyfriend, Richard, said he and many others would have stayed in the clergy if the rules had allowed marriage. “We had to say, are we going to stay in a celibate state, or a non-celibate state leading a double life — or leave and find different ways to live out the ministry?” said Griffin, who lives in Marlborough and continues his spiritual work through CITI Ministries. But Francis’ comments do not suggest any possibility that ordained priests may be allowed to marry, said Griffin, as much as his group would support that. The church allows some current exceptions to the prohibition. Pope John Paul II extended to Anglicans, including married priests, the opportunity to become Catholic in 1980. During the next 30 years, 100 or so Anglican priests entered the Catholic Church and were incorporated into local dioceses, including the Rev. Jurgen Liias , who was married at the time and who preaches at St. Patrick’s Church. Priests in the Eastern Rite Catholic Church are also allowed to be married. During a Girl Scouts event at St. Patrick’s after Mass Sunday, Bernadette Ganino of Saugus was excited about the pope’s comments, saying she is concerned that the marriage prohibition discourages men from joining the priesthood. “I think it worked for [hundreds of] years, but it’s not working anymore,” said Ganino. She debated with a friend, who declined to give her name, about whether a priest’s full devotion to the church precludes marriage. The friend spoke of the emotional and physical toll that devotion can take on clergy, speaking of a priest she knows who has health problems caused by the stress. “If he had a wife, I’m telling you, his wife would not be happy,” said the friend with a smile. After Mass at the Cathedral of the Holy Cross, parishioners were having similar debates. Damris Rosado, 36, a mother of three from Randolph, said priests are supposed to be married to the church. “I want to serve the church 100 percent, but with family, work, and kids that keeps me from doing so,” said Rosado, who still hopes that one of her young sons will become a priest. “I think [allowing married priests] is better than having no priests,” said Luis Rodriguez, 34, of Boston, who said he was torn on the issue. Some in support of allowing marriage said it would make the church more accessible to younger people. Older Catholics too were glad Francis is apparently rethinking the strict rules around priests and marriage. 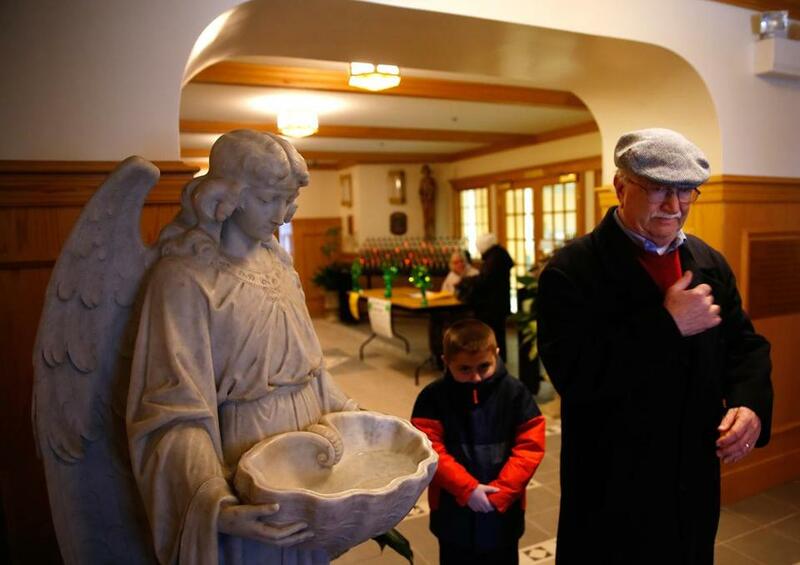 Bill Snell of Wakefield, a teacher of CCD (Confraternity of Christian Doctrine) classes for 43 years who attended Mass at St. Patrick’s Church with his wife, Joan, and grandchildren, said he thinks allowing devout married men to become priests is a good idea. “I think God is in heaven, laughing at all the distinctions we make about religion,” he said. Material from the Associated Press and The New York Times was used in this report. Nicole Fleming can be reached at nicole.fleming@globe.com. Cristela Guerra can be reached at cristela.guerra@globe.com. Follow her on Twitter @CristelaGuerra.